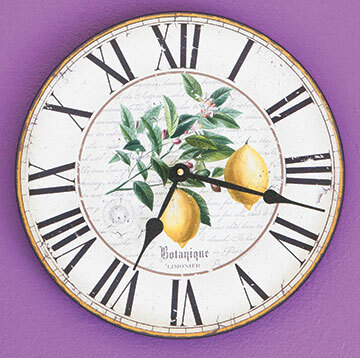 For a chance to win this beautiful botanical lemon clock, pretend you get to decorate an entire home by choosing a fruit or vegetable as its theme and then tell me what your chosen fruit or vegetable would be and why in the comments below. I’ll toss your name into a hat and draw a lucky winner sometime mid-April. You’ll find out how to grow lemon and lime trees indoors, as well as get lots of ideas for lemon-themed décor, in the Apr/May issue of MaryJanesFarm. Stay tuned for more magazine-related giveaways. If you’re not yet a subscriber to my magazine, MaryJanesFarm, subscribe here for $19.95/year. I would definitely choose a Lemon/Lime theme throughout the house. I like the color combinations of yellow and green: light, airy and a good base to integrate other colors. This is so hard. I love my herbs so it would rosemary and apples in the kitchen. lavender and limes in the bedroom. Oranges and thyme in the bathroom. Not sure about the living room. How about cabbages!! They have such lovely colors. I grow them! I could imagine a bathroom done in purple cabbage wallpaper! The green wrinkly cabbage would be interesting in a living room! I could imagine cabbage shaped pillows on the sofa with extra ruffles! Vintage cabbage art prints on the walls!! Can’t wait for other readers ideas! The lemon because when our daughter was stationed in Italy we went to the market in Livorno where she lived and bought table cloths with lemons on it. My sister also gave me a creut with lemons. They are so bright and sunny. My first choice really would be herbs. There is a comfort in herbs. But if I have to chose between fruit or vegetable I chose vegetable. Instead of just one vegetable I would decorate on a collage of vegetables for their color, shapes and a reminder of their awesome flavors. Maybe it is because Apple trees don’t grow down here that I am obsessed with apples! All of the citrus fruits grow here and they can be found everywhere in town in people’s yard. While I love citrus fruits and especially the Satsuma oranges in my yard, I love all aspects of apples; their crunch, tartness, sweetness, many uses, many colors, and all of the history that follows their journey from Central Asia to North America. I love the colors of purple, lavenders, yellows, etc. An interesting vegetable would be the eggplant. Many only think of the deep purple variety but there are many varieties. Using herbs to accent the eggplant would be beautiful. Dreaming of a new palate. Eggplant. They grow in such wonderful shades of purple and some even grow variegated with white and purple. Eggplant is so pretty in the garden with its white flowers and beautiful dark fruit……I have an eggplant kitchen timer…..is it wrong to build a room themed around a timer that I love? I hope not! Watermelon! I love watermelon and it’s a nice and refreshing snack on hot days. It can look really nice as home decor if done correctly! I love pineapples!! I have several items, with pineapple themes around my home. It’s a welcome sign of the past but I think it’s wonderful and beautiful for the present. BLUEBERRIES! I live in Maine and there are lots of them here. I’d choose lemon/lime. The colors of the fruit, leaves, bark, and the blossoms would cover a lovely range of colors. I love pineapples and would decorate with them. I have been searching for just the right pineapple Welcome sign for my 1902 home – their sweet flavor, range of golden-to-yellow colors with green tops, and their historical significance. The Colonial people used Pineapples as a symbol of friendship, hospitality, and status. The pineapple was on many Colonial Welcome signs at homes and businesses. And, I love pineapple upside down cake. I had a grape stencil in my last kitchen that my sister painted…I loved it. Choosing just one was difficult! Grapefruit, because it is from a tree with pretty buds, branches, it smells amazing and comes in different hues and sweetness! That is such a fun and warm feeling clock. I would say cherries are my fruit of choice. There are so many cute cherry decorations out there. Plus red is one of my favorite colors to decorate with. Two of my rooms already involve the color red. Lemon/lime for me. And what a beautiful clock. I would decorate with lemons, grapefruit and cherries. Lemons and grapefruit are so refreshing and their smells are wonderful. I love anything with a lemon or grapefruit scent! I also adore all the cherry fabrics you can make curtains and tablecloths from. Just a very cheerful and slightly retro way to liven up a kitchen. Actually I would use the lemon as the color is so cheery and so easy with which to decorate. Probably apples; my late husband planted three apple trees in our yard and from bloom to pie they symbolize so much and remind me of him and are SO beautiful besides. Probably blueberries! We live in an area that has wild berries. Refreshes as ice cold lemonade in the blistering heat of July and August. Lemons, always lemons!!! My Choice would be apples, them come in different colors and are cheery. I would go with herbs, too. I already have a few things in that direction. But Lemon and some herbs go quite nicely together! I would choose pomegranate, as it is complex in color and has a history, so both classic and timeless yet very now! You could have fun with it for sure! I’d do apples. We have an apple tree that is over 50 years old and still produces 10-20 bushels. Then I put them up. I would choose apples. I love yellows, reds, and greens together, especially in the kitchen. Yellow gives me that happy, sunny, optimistic feeling. Red gives me a sense of strength and warmth. And green makes me think of the peace and harmony in nature. Can’t feel anything but good surrounded by these colors! 🍋 lemons!!!!! I l❤️ve yellow!!!! It’s such a happy color!!! I think I’d have to go with apples, definitely one of my favorite fruits, so sweet and wonderful, and even more in a pie! I’m Vonnas husband. I won’t pretend to know the first thing about decorating. I leave that to the boss. She’s good at it. But I like the clock and think she would too. Hope I’m still qualified. Blueberries. I love the plants, flower and the ripening berry as it changes from light green to lavenders, pinks, mauve, and light through dark blue, as well as the color of the juice. Cherries would be my choice. I love the cheery red color, and the wonderful vintage patterns that you can find for curtains, tablecloths, and napkins. Mine would definitely be lemons because my mom made TONS of lemonade when I was a child. It was only made with fresh lemon juice, which is the best ever! I’ve passed that tradition down to my grandkids in hopes of making “sweet” memories for them. I love to decorate with citrus fruits, especially lemons! thanks for the opportunity! Herbs are my home’s decorative theme of choice. Dainty flowers in various shades of greens in artwork, photos and plants. Various herbs with their blooming flowers make a peaceful setting and the delicacy of scents are true. Lemon yellow is such a good color for a kitchen; it is clean, fresh,and invigorating. Lemons wake up a lot of flavors, from avocados to fish to sugar cookies. Lemon yellow also looks good with most other colors, including black, white, green and even purple; so I can envision it as a backdrop for a living room, bathroom, and even a bedroom. Maybe one could have a lemon tree by the breakfast table, or as a quieting influence in a reading nook. I see lemons plus some oranges in a bowl on a low table in the blue and white family room. Nice! Apples! They are the quintessential American fruit. “An apple a day. . . ” is part of our social fabric. As a decor item, apples come in a wide variety of colors and sizes, and even span seasons from early summer to late fall. From apple blossoms that signal the end of winter, to bushels of bright red wonders tucked away for winter, apples say it all. Cut them through the center, and you’ll see a lovely secret star tucked away inside. Enjoy stems of blossoms in a blue fruit jar in spring, to wine-red wonders peeking from an autumn cornucopia–apples are the best for decor. Lemons or orange, they are so bright and looks refreshing. I would choose lemon because it is so refreshing. It has a beautiful spring feel to it. It is cheery and uplifting. Anything in the citrus family – such a beautiful color scheme. Would probably go with my favorite fruit – grapefruit!! Apples, already have them all over my kitchen. I believe it would be the blueberry. I like the color blue and love the blueberry fruit. Sky and water and throw in some green for the grass..
Watermelon. It’s fresh and bright and just gives you that summer time feeling. I would have to choose the eggplant…love the variety of purples they come in and they are so beautiful.